The speed of business is increasing, but what are organizations doing to keep up with the challenges that come with this increasing pace? What can they do to keep ahead of the curve, capitalizing on the opportunities available to them? It all starts with automation. Improved relationships with suppliers through more timely and accurate payments. Increased accuracy and speed that come from taking the human element out of the AP process. Decreased labor and materials costs that come from ridding paper-based invoices and checks from an organization. Better discount capture, more visibility, and fewer lost invoices. 75% of payments are still made by check and 70% of AP professionals say at least half of their invoices are still done on paper. Unfortunately, these paper-based processes stand in the way of the two-year plan for AP organizations, whose top goals include automating more, improving collaboration, and reducing operational costs. Automating accounts payable has profound effects on organizations. 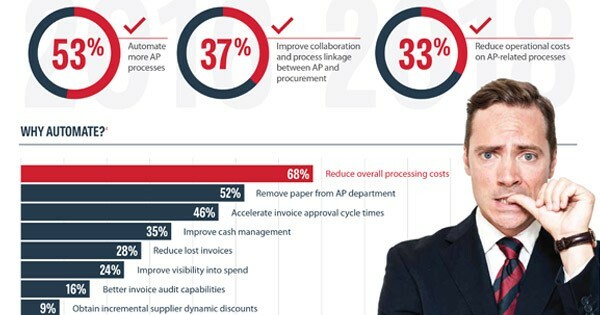 According to the Electronic Invoice Adoption Report, 68% of organizations that automated AP reduced overall processing costs, 52% were able to remove paper from the AP department, and 46% were able to accelerate invoice approval times—leading to faster payment and more savings through discount capture.